While we weren’t too excited to already be this far North in early April, our destination made that reality much sweeter. We needed to be in the Philadelphia area the week prior to Easter for a tax appointment and some family time. Lucky for us our travel schedule had a few days to spare to sneak in a visit to our good friends, the Workmans in Dover, PA! We brought our home to theirs as they graciously allowed us to park Charlie & the Big Tow'er on the farm! They had plenty of company with lots of big trucks, tractors, and trailers to swap stories with during our stay. Charlie might have even told them about his little booboo when his ladder scraped the road, bending it just a bit after a turn off a steep slope on the way to the farm. Yikes! Man we were glad to see that the bottom rung of the ladder was the only casualty of the incident. Once we had Charlie situated in his parking spot and fired up the generators to keep the fridge running, we packed a few things and headed across to road to the Z & Z Acres farm house. We are lucky to have such wonderful friends who play the role Bed & Breakfast hosts so very well. The Workman’s just expanded their farm operations to a second property located less than a mile away. So that afternoon after catching up with Ed, Missi, Zach, & Zoey we headed over to the new farmstead, Z & Z Farms. 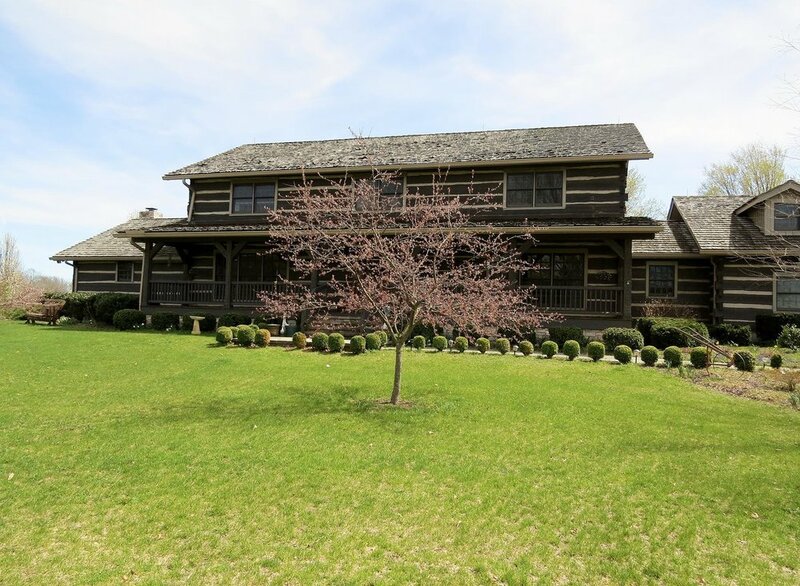 What a gorgeous property of 120 acres of grassy, hilly pastures and two homes. We loved the home tours of both Zach & Grace’s house (a lovely farmhouse) and Missi’s parents log home (wowzers - quite impressive)! Since Russ & I don’t have any pets of our own, we were looking forward to meeting a few new pups we had heard about. 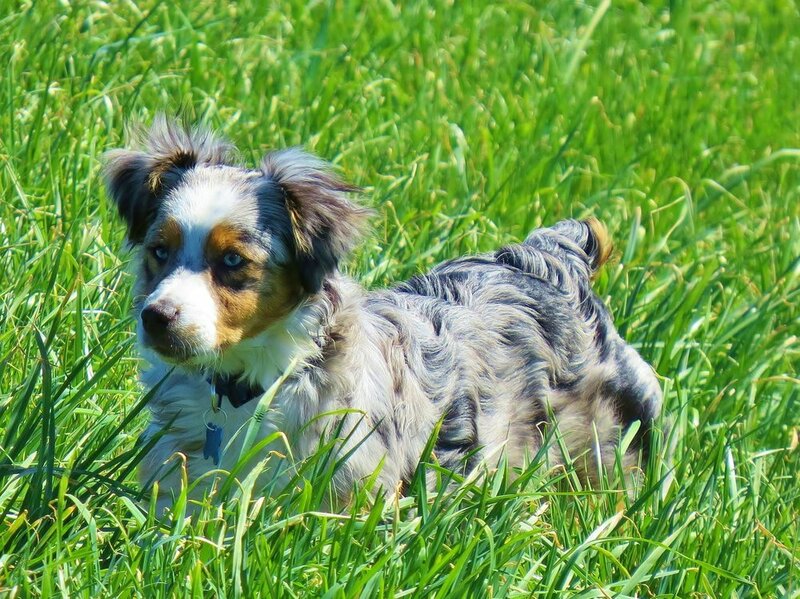 Zach’s newest farm pal- Macy, a Miniature Australian Shepherd and Zoey’s newest sidekick - JoZie, a Blue Heeler. These pups join the pack already comprised of ZiZi, Joy, & Bo! But no farm is complete with just dogs, we also got to check out the cattle, many of which arrived the same day we did. Lots of cows & calves! This made me very happy because for some reason I find cows incredibly cute. Our timing was perfect as I got to help bottle feed one of the sweet boys! Puppies, calves, and chicks made for lots of smiles and squeals. Because I can’t seem to get enough of those sweet calves, Zoey took us for a little tour of the farm where she works. She takes care of hundreds of calves every day. She is definitely a cattle whisperer, knowing exactly what each little one needs. It was so cool to observe her in action, feeding, treating, and checking each of the calves during her shift. Thanks for taking the time to show us around, Zoey! We really enjoyed seeing the whole operation. I couldn’t help it and had to pick a favorite! Isn’t he a cutie…. Considering what the weather is often like in April, we were treated with just about perfect weather during our visit. Sunday afternoon’s weather was just screaming for a walk. Ed was more than eager to take us for a walk being just slighty more excited than Missi for the afternoon’s exercise. Missi warned us that the walk was hilly and she was right, but we all enjoyed the walk and opportunity to chat along the way. The promise of ice cream at Sarah’s Creamery gave us all an added pep in our step. YUM! Since this is Penn State Ice Cream, I must say "GO BUCKS!" You know how life just gives you some things that make perfect content for the game “Two Truths & A Lie”. Russ and I gained the perfect “truth” during our stay with the Workmans. We can now both say, “I’ve eaten beaver meat” in which most people would probably consider the lie. I have to admit, it was pretty tasty. Zoey’s boyfriend, Adam, was the cook and prepared it just right. It tasted like a well cooked beef roast, simmered in wine and surrounded by cooked potatoes and carrots. He was a big critter too, weighing in at 48 pounds. Well done, Chef Adam! While our visit is over, we are still enjoying the bounty from our stay - farm fresh eggs! Thanks for sharing the yolky wealth. We can’t wait to see you again in August for Zach’s wedding. Consider this our official reservation for another stay at the Z & Z Acres B & B! Apr 18 Easter, Taxes and the Rest of My Siblings . . . Oh, My!